These volume dampers are appropriate for a broad range of applications, including: heating, air conditioning, exhaust and venting. They come standard in round but can be custom made in other standard shapes upon request: oval and rectangle. 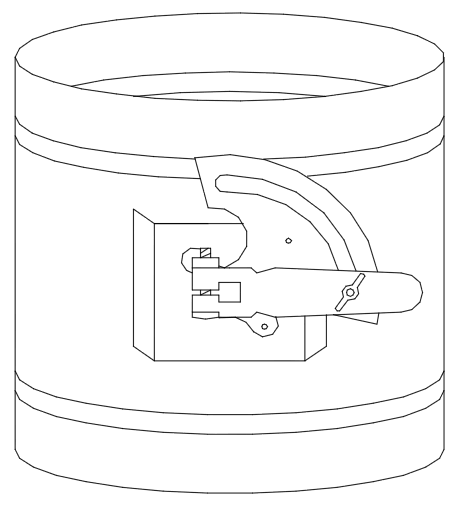 Standard dampers feature a manual locking hand damper, but can be fitted with other custom locking systems upon request. As specified, these are certified for use with Wal-Mart and Sam's Club applications. - 13" and larger - Min 20 GA.
L = 20" for Diameters greater than or equal to 20"
L = 15" for Diameters 14" through 19"
L = 10" for Diameters 9" through 13"
L = 8 1/2" for Diameters less than or equal to 8"
For square and non-standard dampers, please call for pricing. Unless specified, 4" & up are slip fit, to go inside of spiral pipe. Data subject to change without notice.